I am very lucky this year, getting to cover E3 from the glory that is LA. It’s hot, it’s exhausting, and it hasn’t really even begun. Microsoft kicked things off with their press briefing – here’s how it all went down. Darryn will be posting galleries, so be sure to check them out for all the impressive images from the day. First things first, Xbox’s press conference started off on a different note, handing out wrist bands that would later become LED lights – that Galen centre was awesome when they were lit up. Microsoft was totally on message, too – keeping the focus entirely on the games the whole time. There were a ton of things shown off, so here’s how it went down. Starting things off with a bang, Microsoft kicked off with the Call of Duty: Advanced Warfare trailer. It was big, it was loud, and it showed off some impressive new tech. I was particularly blown away by the detail in facial expressions, and the gore. Moving from the pew pew to the vroom vroom, we found out that the Nurburgring was available for Forza. It’s a killer track, and awesome for Xbox to make it available immediately. Relieving people’s fears, Xbox confirmed that we’d be seeing more Forza in 1080p. After an all-too-brief trailer for Evolve, we got some fantastic footage out of Assassin’s Creed Unity. Sneak with your friends; ACU showed off some brotherhood multiplayer that lets you get sneaking and stubby with your friends. The crowds looked way more realistic and even parkour has been revamped, although combat basically looked the same as always. Giving more pretty trailers to rub our eyes on, Dragon Age was up next, showing off some beautiful new visuals. Then we were treated to the romp that is Sunset Overdrive. I will admit that I wasn’t all that hyped for the game before E3, but this latest trailer is making me have a serious need for an Xbox One. Speaking of a romp, Dead Rising’s DLC was up next, and it has the most epic name (and gameplay) Microsoft has released: Super Ultra Dead Rising 3 Arcade Remix Hyper Edition DX Plus Alpha. Yes, it is just that awesome. The Fantasia and Dance Central people were up next, although (like the Kinect) they were ushered out without much commentary. Instead, we jumped right into Fable Legends. It may be a great RPG, but it seemed to rely rather heavily on the RPG cliches for my taste – but it added tower defense. Project Spark was next on the Agenda, and while it looked okay, it still wasn’t quite convincing. Conker was shown off, but only within Project Spark, leading to a unanimous “awww” in the audience. The Halo Master Chief Collection is designed to introduce gamers to the entire Master Chief story to prepare for the launch of Halo 5: Guardians. 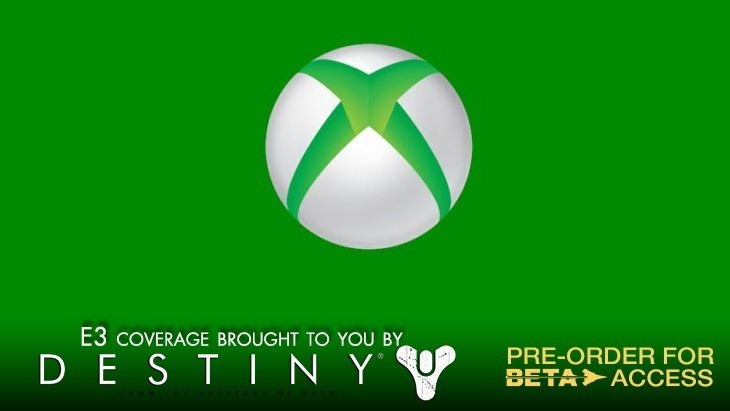 The entire collection will be playable in 1080p, 60fps on Xbox One. Quite a feat. The Halo 5 Guardians Beta will be coming in time for the holiday season. Surprisingly, those were just the games coming out this year. So much for that “everything is delayed until 2015” moan that gamers were having before E3. That’s a lot of games. Looking into the coming year, Xbox showed off a montage of indie games, followed by a fantastic world premier for the new Tomb Raider. But it was the next game, The Witcher 3, that got everyone really excited. It’s looking fantastic, and we only saw a small snippet of gameplay. Let the fanboys rejoice, next up we had news of the Phantom Dust revival. This was followed by excellent footage of The Division – we can only hope that this time the gameplay was actual gameplay. It had some new display interfaces and looked very slick. Scalebound was next, although when it was followed by the Crackdown trailer that got the crowd (and particularly Darryn) excited. Well, that and the awesome Sunset Overdrive bus parked out front of the conferences.